Laura Hutto, 7, joined her Cub Scout brother in archery, BB gun shooting and hiking last summer at a campout. But when it came time to collect activity badges, Laura wondered why she went empty-handed. Her mother explained to Laura that she, as a girl, didn’t qualify. 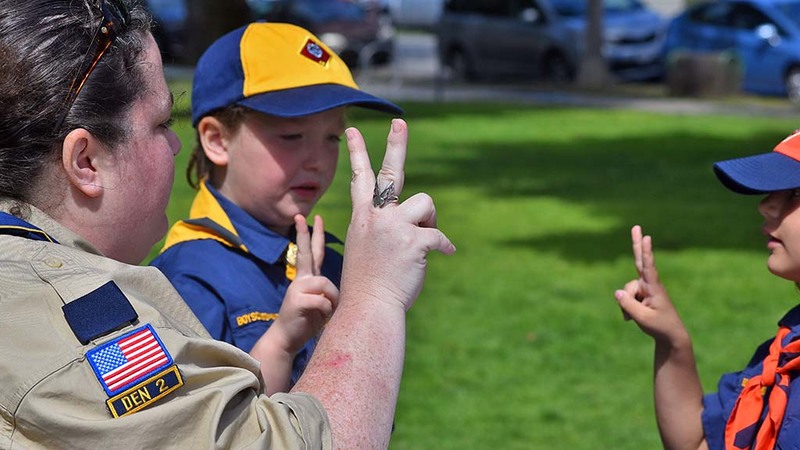 Today she is the first registered female Cub Scout in San Diego County. Wednesday night, she received her Bobcat patch. Oliver Brown, 9, is the son of Erin Grady Brown, Cubmaster of Laura’s pack. He had no problem with girls being Cub Scouts. 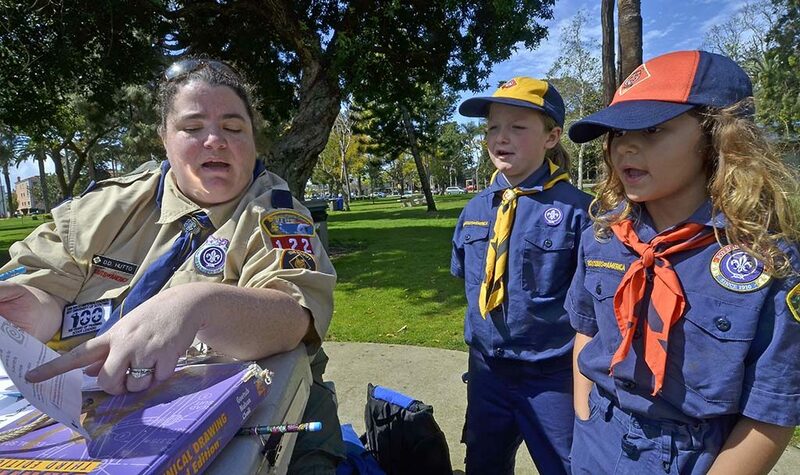 Laura is one of four girls in the pioneering first female Cub Scout den — Den 2 of Coronado’s Pack 122, the result of a decision by Boy Scouts of America to allow girls to join Cubs in 2018 and Boy Scouts in 2019. The pack, with nine dens, is part of BSA’s San Diego-Imperial Council. Laura said she screamed with delight when the announcement was made. “I was so excited that I could do more things with my brother and actually get prizes and get badges … all of the stuff that I did with my brother,” said the 7-year-old. 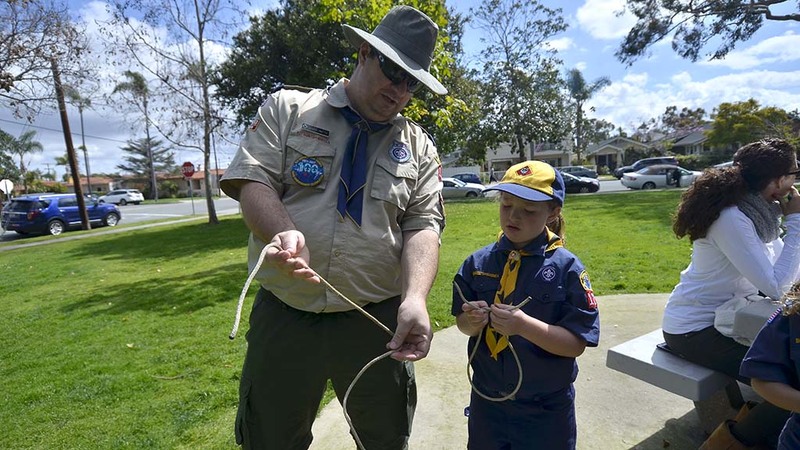 It was this kind of experience that moved the Boy Scouts to make such a momentous change. 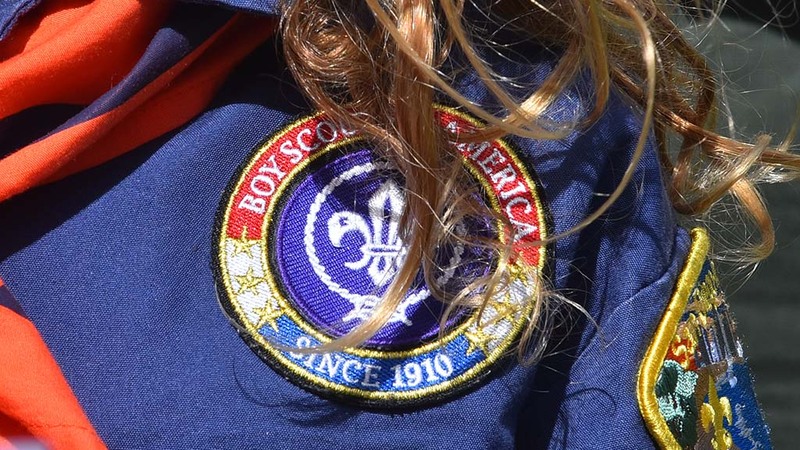 In a statement last October, Boy Scouts of America said the “historic decision” came after years of receiving requests from families and girls. Indeed for this reason D.D. Hutto agreed to be den leader for her daughter and three other girls, despite the abbreviated scouting year. Hutto said having both her son and daughter in Cub Scouts was more convenient for their schedule. As part of an “early adopter” den, the girls have to finish a year’s worth of Cub Scouts requirements in just three months. Packs can allow the creation of all-girl dens or stay all boys. 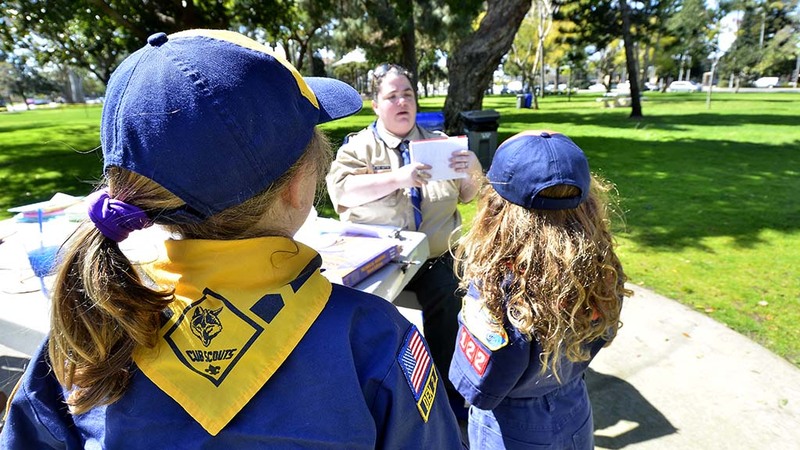 Visalia in the San Joaquin Valley claimed the state’s first all-girl pack in January — Pack 1920, a nod to the year American women won the right to vote. The Optimist Club of Coronado is Pack 122’s charter organization. 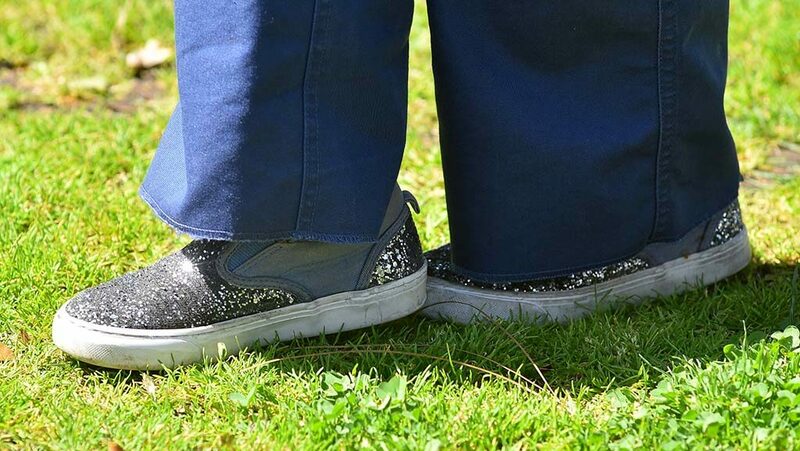 After it gave girls a green light, Hutto greeted the challenge head on by doubling the number of meetings (to twice a month) and growing the meetings from an hour to 90 minutes — to ensure the girls met their requirements for rank patches in May. Her den’s small size allows her to more quickly complete the units. Hutto observed her son’s Wolf program last year and uses that as her model. “I’m very proud of my daughter to be the first one officially signed up,” she said. Three of the girls are doing the Wolf program for second-graders and one is a Tiger in the first-grade program. At their latest meeting, the girls learned about the history of coins, knot tying, how to prepare for dangerous weather conditions and what to pack on an outdoor outing. 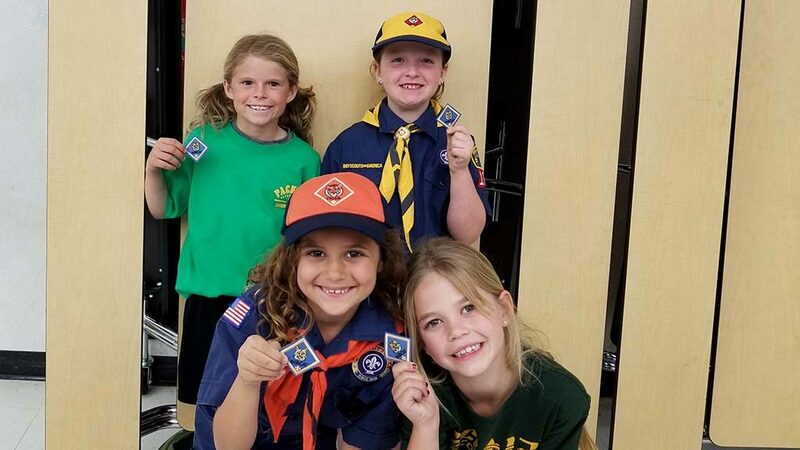 Girls wear the traditional blue uniform that the boys have worn, except this year a skort has been added for girl Cub Scouts. “I think it’s amazing. I am so proud of her,” said Anthea Rodgers, whose daughter Evangeline, is in this early group. Evangeline wore the uniform her brother had last year. She has equal praise for the Girl Scouts: “They do really fun stuff. We meet people and we go to fun places. It’s just really cool.” She will continue to be members of both organizations. Evangelina’s mother noted how the groups focus on different aspects. 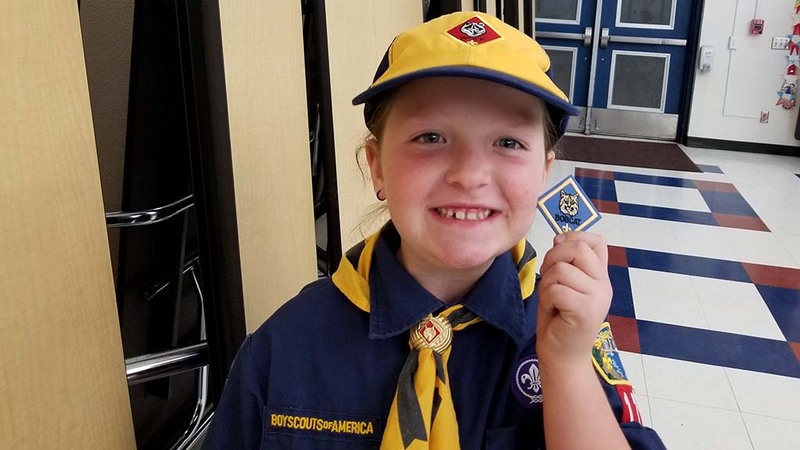 Victoria Randall, 7, wanted to join the Cub Scouts because she loves to go camping. Victoria’s mother, Annelie, said her daughter is very adventurous and athletic, so she thinks it will be a good fit. 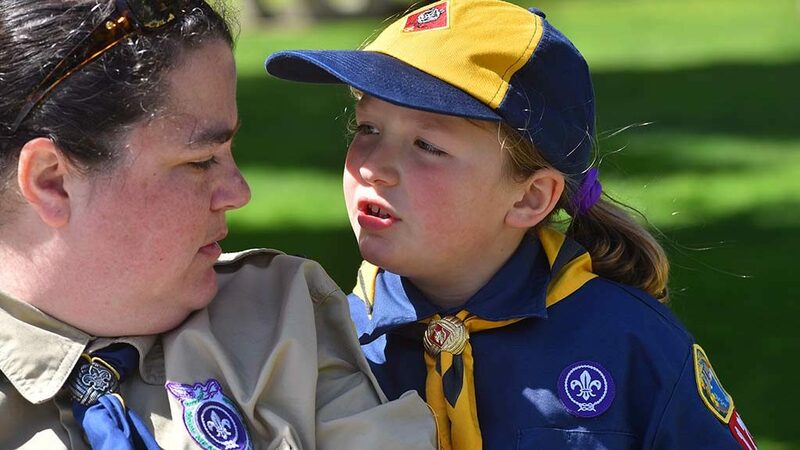 However, the Scouts’ new gender policy hasn’t been without its critics. Last August, Girl Scouts President Kathy Hopinkah Hannan sounded warning bells. Hopinkah Hannan accused BSA of making the change to reverse declining enrollment. 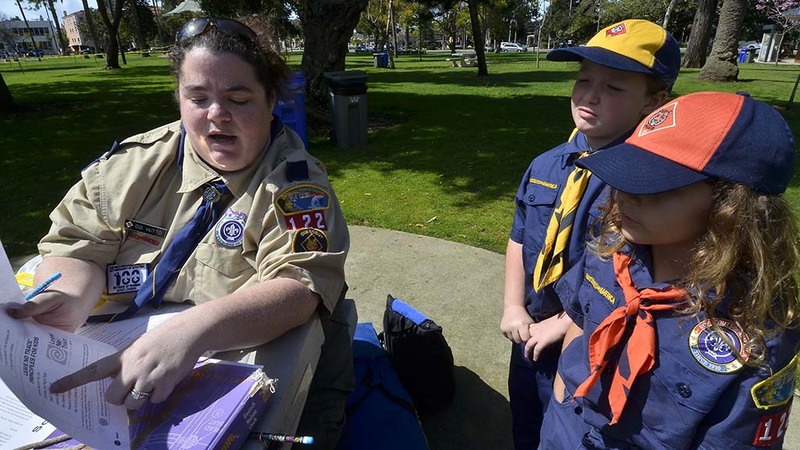 Both Boy Scouts and Girls Scouts have seen membership drop, media reports said. Cubmaster Brown wants to set the record straight. “I don’t have any desire to steal girls from the Girl Scouts, so I have to be careful when I recruit because I don’t want to give the impression that that’s what we are doing,” Brown said. She said she loved the Girl Scouts, and considers both programs wonderful. “In soccer, you drop your kids off and cheer them from the sidelines, but you’re not an active participant. 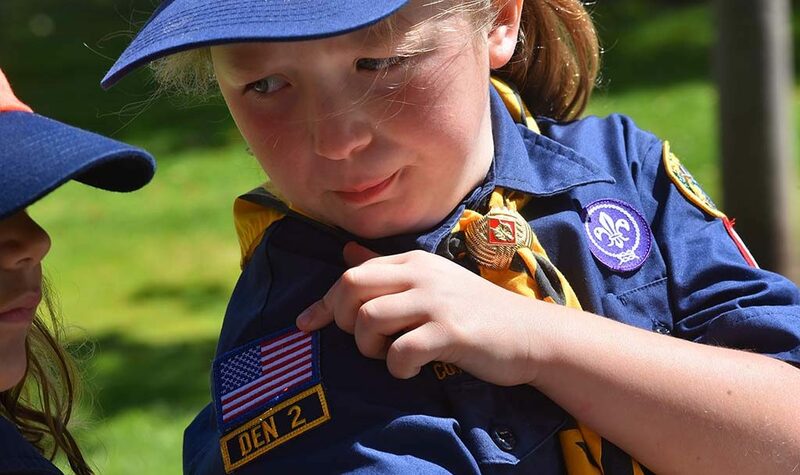 Whereas in Cub Scouting, the parent and siblings are active participants,” she said. 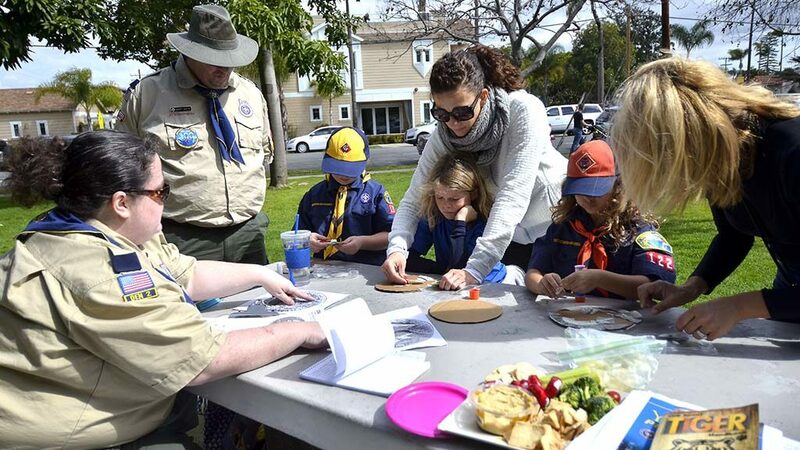 With so few truly family activities left, she said, Cub Scouts also gives parents an opportunity to be with their children. Brown decided to keep this first girl den small, so girls didn’t feel overwhelmed by the condensed schedule. Two of the girls had already taken part in Cub Scout activities last year with their older brothers. 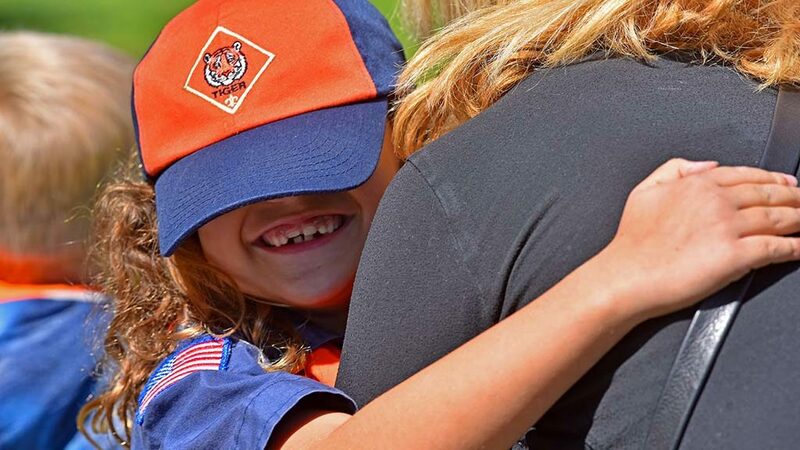 “They had Scout Night at the [Padres] ball game and that’s for all Scouts, but they have to be in a uniform to walk down on to the field, and she (Laura Hutto) couldn’t come down. And she was so upset,” Brown said. “That will always be the thing that sticks in my mind because she is at every one of our meetings, she participates fully in everything that she is allowed to do, so I would see no difference in her officially being a member of the pack rather than a mascot,” the cubmaster said. Brown feels misconceptions may fuel opposition. “It’s not that all of a sudden that girls are going to be in every den,” she said. 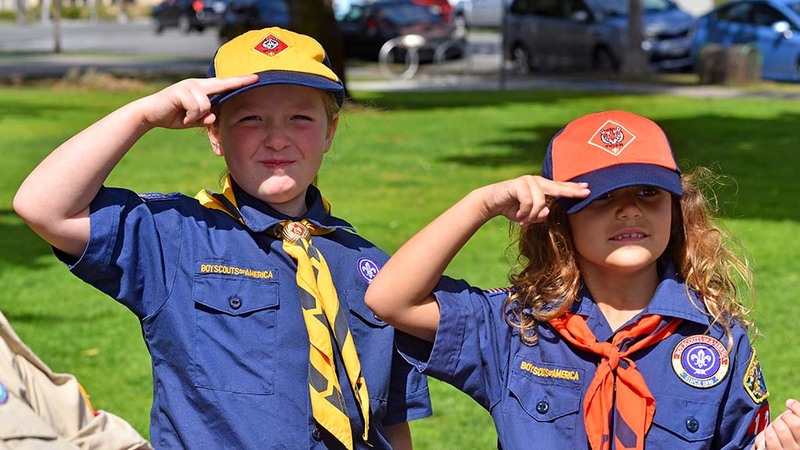 In fact, other divisions of Boy Scouts – Sea Scouts and Venture Scouting – have welcomed girls since 1969. STEM Scouting also is coed. Brown believes coed scouting fosters respect between the sexes. 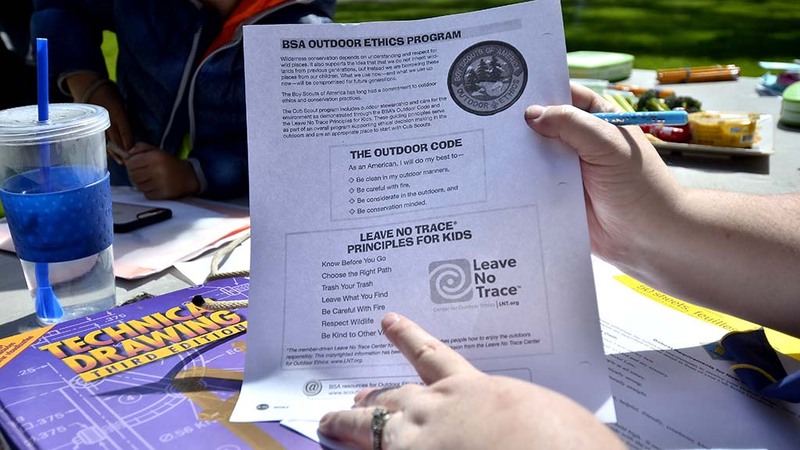 The Boy Scouts long ago established guidelines for child safety for all single-gender and coed activities. Locally there has been more than one negative encounter with a resident of Coronado. 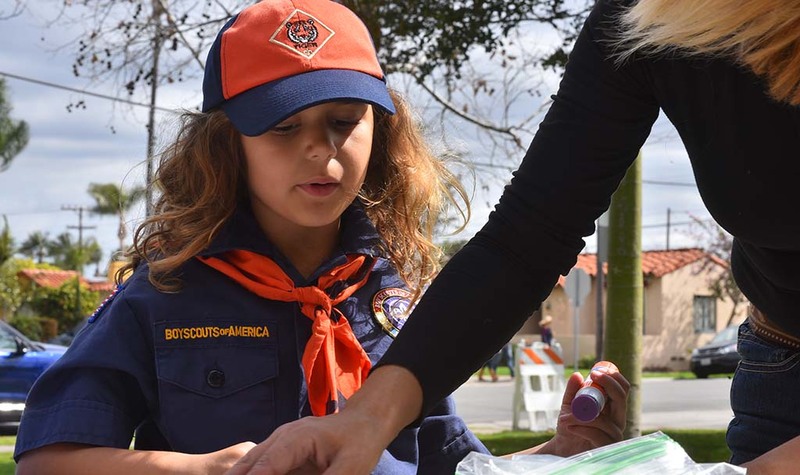 While Hutto was in front of Vons with her son and daughter in the fall, selling popcorn for Cub Scouts, an older man, opposed to the change, approached her son and asked him how he felt about allowing girls in Cub Scouting, Hutto said. 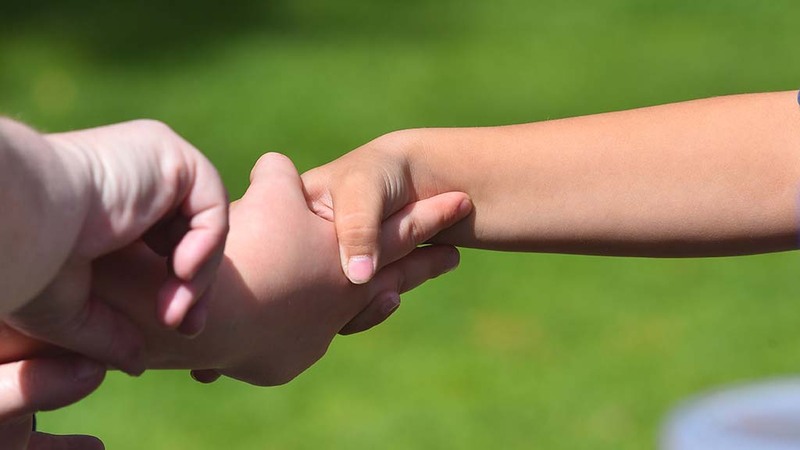 When her son told the man he liked doing activities with his sister, the man left, she said. 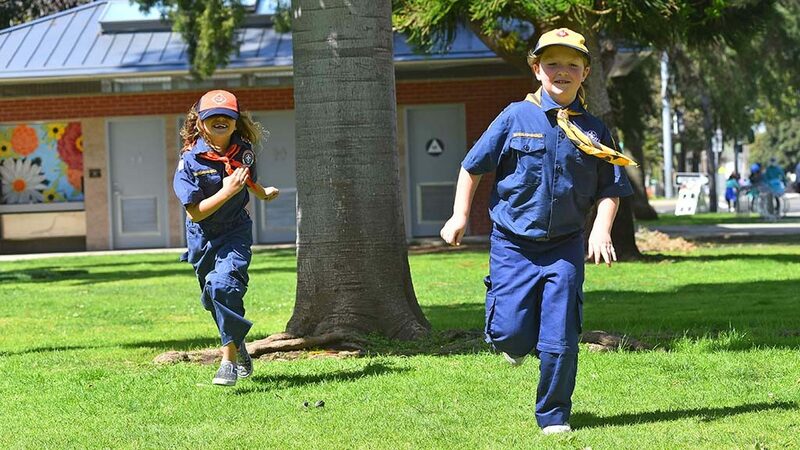 Girls will be allowed to enter Boy Scouts in 2019, and it will be up to one of the two Boy Scout troops in Coronado to decide whether to let the girls continue in scouting. Asked about his participation in the den, Scott Hutto said, “Honestly, I am overwhelmed. I think it is great. I’m just going to take it one day at a time. We’re going to do the best that we can.